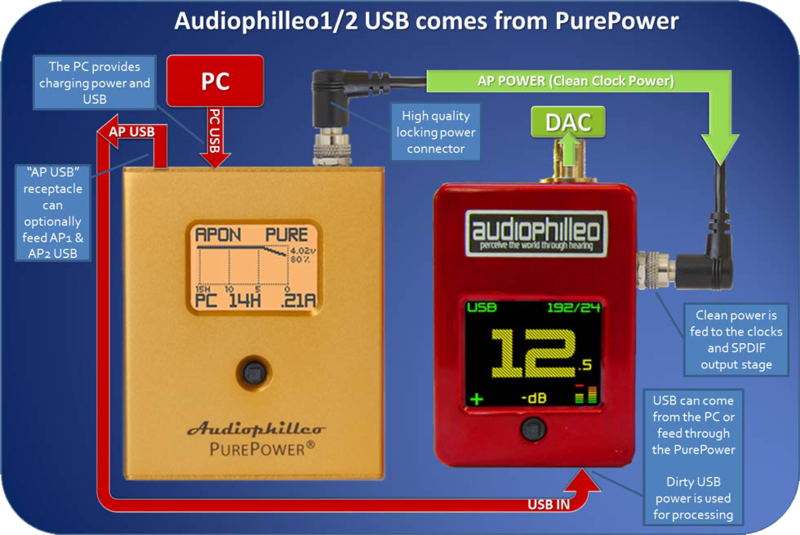 There are 2 ways the PurePower can be connected to the Audiophilleo1 or Audiophilleo2. Both ways require the PurePower power output to be connected to the additional power connector installed on the Audiophilleo1/2 - using the included threaded locking power cable (shown in green in the diagrams below). The diagram below shows how the PurePower feeds USB through to the Audiophilleo1/2. This requires only a single USB connection to the computer. In this case the PurePower is always plugged directly into the PC for charging and USB. The diagram below shows how the Audiophilleo1 or Audiophilleo2 is connected directly to PC USB port. This requires two USB connections to the computer - one for the PurePower and one for the Audiophilleo1/2. Also, the PurePower may optionally be plugged into a USB wall wart power supply instead of the PC, requiring only one USB connection to the PC (from the Audiophilleo1/2).